Over the past 24 hours, we’ve seen the effects of extreme rainfall rates over a localised area in a short to moderate period of time. 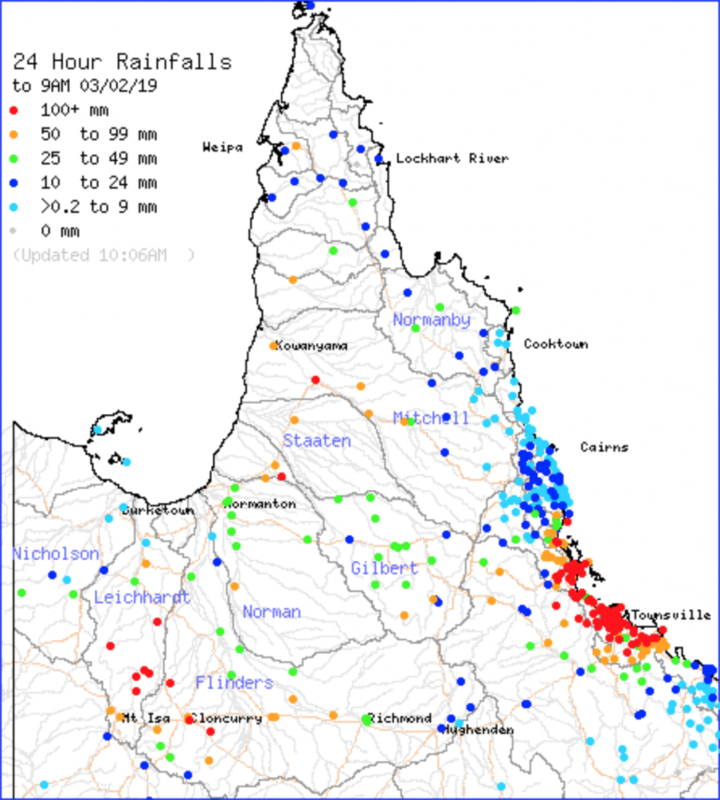 This was indicated by Ingham recording over 500mm in a 24 hour period, most of that falling after sunset, with rates of more than 100mm/hr being recorded in Ingham and surrounds. The continuous rainfall over Greater Townsville has also lead to the City recording its wettest week in history – beating the Night of Noah by over 100mm! • Paluma’s total of 1667mm or the Paluma Alert total of 1600mm – both fit the criteria – rank this as the third wettest event in Australian history (QLD hold the top 5-7 titles of rain events in Australia). This places it above the 1318mm at Mt Glorious in 1974 and just behind Mount Bellenden Ker 1870mm (1999) and 1947mm (1979). There is every chance that based off of forecasts, that the 1947mm total could be reached. • This is now 6 consecutive days that someone across the Ingham to Mackay region has recorded in excess of 300mm. • Paluma, Paluma Alert, Upper Bluewater, Rollingstone have all recorded 7 consecutive days above 100mm, Paluma Dam falling 1mm short (99mm on Thursday) of this feat as well. Multiple locations have recorded at least 5 consecutive days above 100mm. 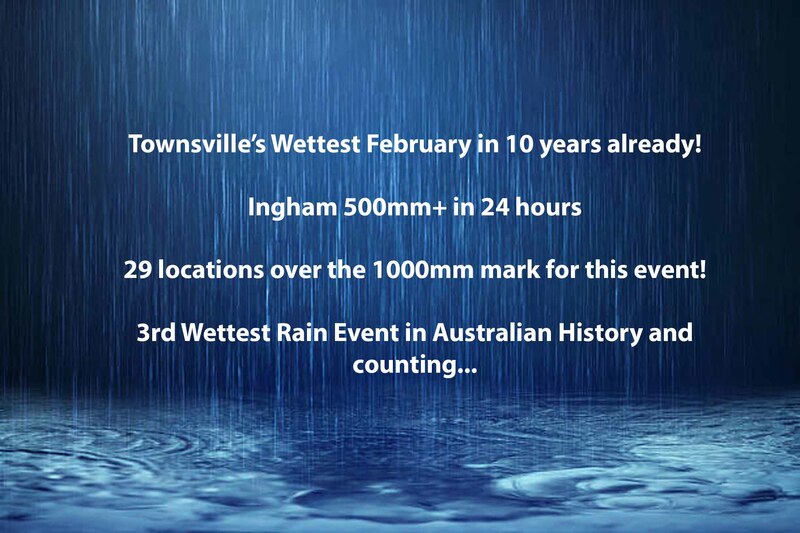 • 3 days into the month and this is already the wettest February in 10 years (2009) for Townsville City – the total of 960mm that month is also the benchmark (current record) for February and based off current forecasts, theres no reason Townsville won’t surpass that. Further good falls have also been recored North of Mount Isa. Models were indicating an area (and still are) of excessive rainfall just North of the highway running from Mt Isa to Cloncurry. These model predictions are now coming to fruition.